Wilkinson motorcycles were launched in 1903 by Wilkinson Sword as a small range of single and twin cylinder motorcycles. Wilkinson Sword was originally founded in 1772 and their products, as the name implies were swords, other bladed weapons and shaving razor blades. As time went on, they expanded their operations into a wide variety of products and in 1903 launched a small range of single and twin cylinder motorcycles. Typical of Wilkinson's engineering, all their machines were engineered to the highest possible tolerances and quality and the design was literally decades ahead of it's rivals. These early machines were powered by the French Antoine engines and marketed from a dealership in Chelsea, London which was one of the first ever motorcycle dealerships in Great Britain. Although these machines are now extremely desirable and collectable, they were not a commercial success at the time. By the early 1900s, Wilkinson had recruited a young designer by the name P G Tacchi who in 1908 patented a design for a vee twin, full suspension military scouting motorcycle that could be equipped with a variety of options that included a handlebar or sidecar mounted Maxim machine gun. Unfortunately and very short sightedly, the Government of the day declined to show any interest. Wilkinson were not to be deterred and quickly introduced the machine, minus the Maxim and other military options to the civilian market. This machine was fairly successful but Wilkinson and Tacchi knew they were capable of producing machines that were far better and it wasn't long before they produced their next generation of luxury touring motorcycle that they dubbed the 'Touring Auto Cycle' or 'TAC' for short. The Wilkinson TAC was a true marvel of modern motorcycle engineering. This machine featured a 676cc in line, air cooled four cylinder engine and came with leaf spring rear suspension, foot clutch, three speed gearbox and shaft drive. At the front end was full suspension on the forks and early models had the option of swept back handlebars or a car style steering wheel. This and later models from the Wilkinson stable were usually equipped with a left hand throttle as standard. Wilkinson knew they were on a roll and soon after bettered the TAC with the Wilkinson Touring Motor Cycle, also known as the TMC. This machine was launched at the 1911 Stanley Clyde Motorcycle show in Islington and it came with a similar in line four cylinder engine to the TAC but this one was initially enlarged to 850cc which was later changed to a 1000cc engine. Other luxury features was a car style, leather upholstered seat. There were only about 250 of these stunningly elegant three speed, shaft drive machines ever made and engine size appears to have varied from 850cc to 1000cc depending upon year of manufacture. In the spring of 1916, Wilkinson were forced by the Government of the day to cease motorcycle production and instead resume production of bayonets for the war effort. Wilkinson motorcycles only lasted for a few short years but during that time, they were decades ahead of all the competition in luxury touring motorcycle design and technology and their demise was an immense loss to the British motorcycle industry. 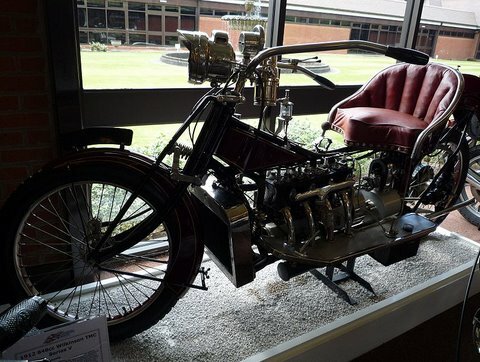 After the conclusion of WWI, Wilkinson decided to resume production of their in line four cylinder engine but decided that they would use the engine in a car they dubbed the Wilkinson Deemster and they never resumed motorcycle production.